It’s been a busy month since my last post. I’d like to say it’s all been joyous merrymaking, but, well I’m not going to bore you with the details. Suffice to say: strikes and gutters. I took out our Christmas tree this week, and Adam cut off all the branches. 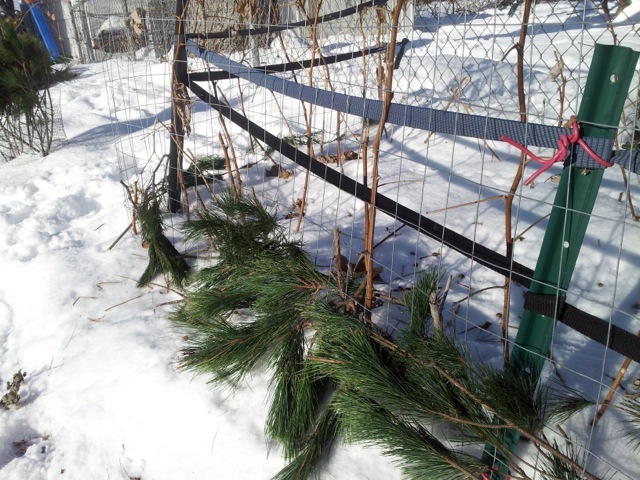 I put them along the bottom of this fence, which we put up in October in hopes of defending my raspberries from rabbits. I didn’t spring for chicken wire because this stuff was cheaper, and those holes are really small. However, the varmints are getting in. I watched one hop right through the fence Friday night, to feast on my precious canes. There’s actually not a whole lot I can do at this point except hope that my Christmas tree branch blockade will at least confuse them while Adam prepares for some very local rabbit hunting. He’s set up a little food stand in one part of the yard to bait them. We’ll see how it goes. 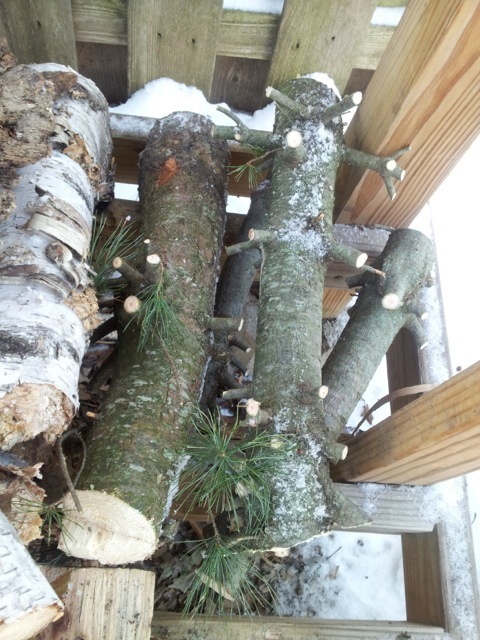 Instead of hauling the newly-bare Christmas tree trunk out to the alley, Adam sawed it into a few pieces and threw it on the wood pile. We’re currently heading a into record cold snap, which, by the way, is not all bad! Apparently there’s a good chance of emerald ash borer die-off. Silver lining, right? We still have just over half the pork fat left from two hogs my family purchased this fall. 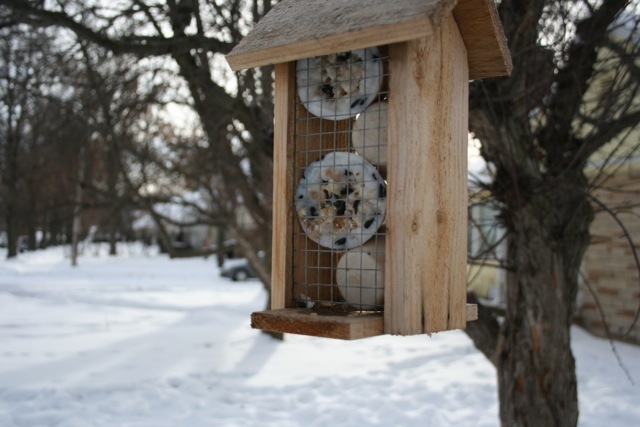 So Adam used the last of an old bag of bird seed and made some suet. The squirrels have been sniffing very curiously at this but so far I haven’t seen any birds on it. I’ve hardly seen any birds around AT ALL, though, so perhaps it will take a few days for them to discover it. 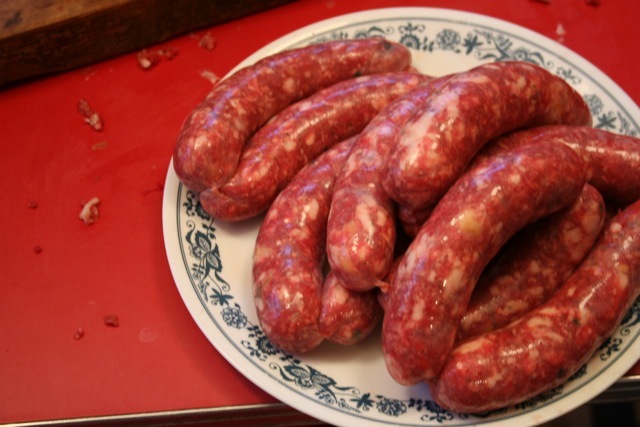 Adam’s making venison sausage on a regular basis now—and we still haven’t gotten through our store of ground venison or pork fat. I’m anxious to try this new one, which included Gamle Ode “Holiday” Aquavit. We gave some away to family and friends, so we went through our initial batches quickly. For several months now, we’ve been using this chenille cleaning cloth on our swiffer sweeper, instead of buying the cloths. 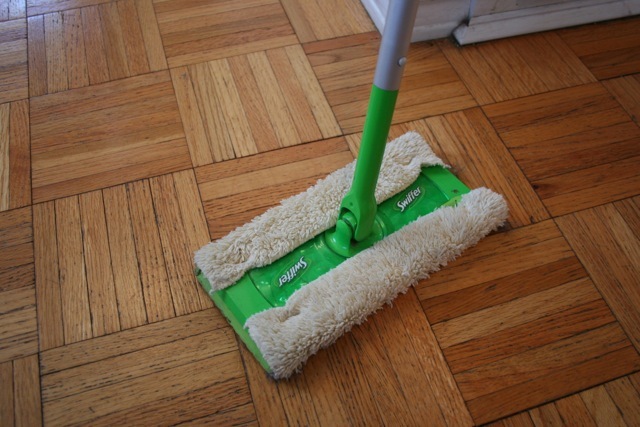 Take it outside and shake it out a few times while cleaning, then throw it in the wash when done. As far as I can tell it works the same. One less thing to buy, check! 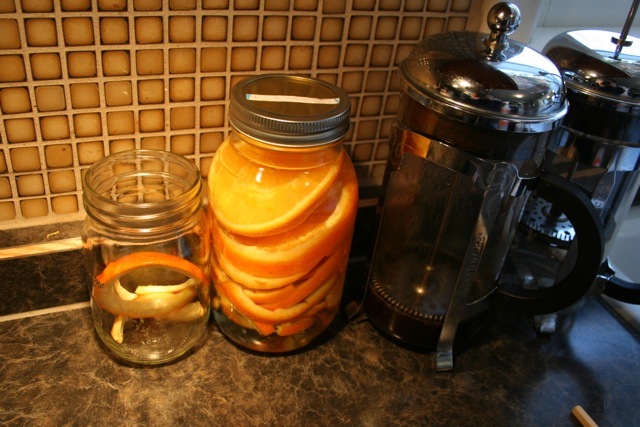 I’m also trying this suggestion for citrus-infused cleaning vinegar. I’m guessing a little of the orange oil gets into the vinegar too, which would make it ideal for cleaning our wood floors. On the left, some peels that we’re drying for adding to herbal tea. Finally, I received a bag of yarn from Adam’s grandma who died almost three years ago, and am using it to teach Anneke to knit. (Rowan’s not interested, for now.) 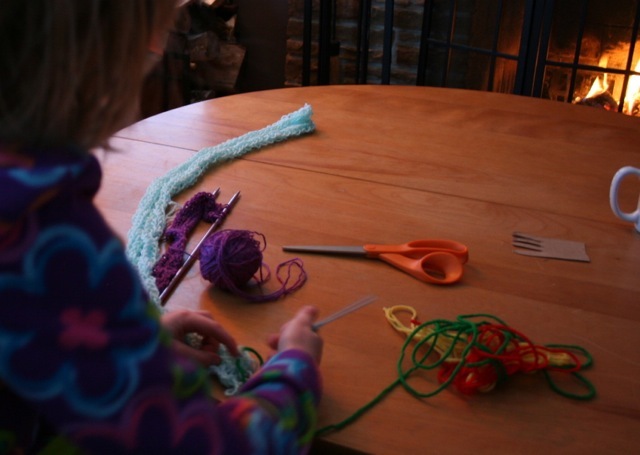 She picked it up really quickly, and I like to imagine how happy it would make Grandma Miller to see her great-granddaughter using up her old yarn. Anyway, there’s a handful of positive developments around here. Happy New Year! Categories: Practical | Tags: edible landscaping, wild game | Permalink.